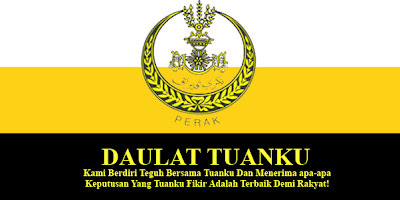 KEEP TUANKU OUT OF POLITICS ... the Dirty Pakatan Rakyat Politics. This WARNING goes to everyone, especially Datuk Seri Anwar Ibrahim, Karpal Singh, Lim Kit Siang, Hadi Awang, axed-MB Nizar, Malaysiakini, Malaysian Insider and others who seem to have the tendency to be KURANG AJAR! JUST DON'T PUSH YOUR LUCK! If you guys have initiated and agreed to play football without the application of the 'off-side' rule then don't cry when your opponent scores to win from an 'off-side' position. Just go home and kick yourself ... if not satisfied yet then go and KICK the guy who has been promoting this brand of politics. p/s YB Ibrahim Ali has be dethroned, he is no longer the Katak of Malaysian politics. The real King of Frogs is Raja Katak Anwar Ibrahim. He has no moral standing now to accuse the BN of any wrong doing since its all his idea. What goes around, comes around ... but I really never expected it to be so soon. God is Great! That FINGER is all yours now, Saudara! I still remember the person who hold Keris and said, 'Kill Chinese', and was not being detained during operasi Lalang, you know who? Oh...forget, A King is not subjected to Court of Law even if the commit criminal offense...kekeke...that's why they can not be SAMAN or CHallange...if not, UMNO will have rally with banner on the street! That's a superb shot of THE man. THE finger is placed right between the short-sighted eyes! Idiotic comments which ridicule the Sultan would not be published in this blog. TQ. Komen-komen KURANG AJAR yang menghina Tuanku Sultan dan Institusi Kesultanan tidak akan di-siarkan dalam blog ini. Terima Kasih. you quote as if you heard the phrase yourself. If I may remind you there are no records of him uttering those words officially...but it seems that all that is accused by the opposition must be taken for the truth...anything else and you will be condemned! very just and fair indeed! Flanker is right... hey Anon, did you hear someone say "Kill Chinese'? Its racists like you who ruin this country. It's good to see someone defending the Sultan who did what was right for his state. Those who maligned the Sultan of Perak should get the facts right. Those who have been throwing mud at the judiciary should also get their act together. Do you really think these people, who are paid pittance, not allowed to mix freely in society and can't even defend themselves like the common man on the street, politicians and anyone else, should even care who wins or loses. Yes, I agree there may be corrupt judges in the institution but to be fair, do you think one bad apple represents the rest who just want to do their duty to the country. Have a heart people. You want to tear people integrity into shreds, get your facts right! At least, THINK! Don't spew verbal diarrheoa. We, the common people, who are still in charge of our faculties, know the truth! still remembered Terengganu MB selection after PRU12...the federal keep pushing the sultan and using very harsh words to the Sultan. The banner made by UMNO Terengganu viewed by TV3 around the nations but no action against UMNO. Those are liars and hypocrates.